March 18, 2016 - The U.S. Department of Transportation’s Federal Aviation Administration (FAA) proposes a $917,000 civil penalty against the Puerto Rico Ports Authority for alleged aircraft rescue and firefighting violations at three of its commercial airports. - The airport is required to have two aircraft rescue and firefighting (ARFF) vehicles based on the type of aircraft it serves. On March 25, 2015, one of the vehicles was unable to perform its required functions because it failed to correctly mix firefighting foam and water. As a result, the airport did not provide the required ARFF capability. - During a demonstration the same day, ARFF personnel failed to begin applying extinguishing agent within the required three minutes of an alarm sounding. Moreover, the airport’s ARFF vehicles did not have two-way voice communications to maintain contact with other emergency vehicles and with the airport fire station. And one firefighter had a damaged fire suit so was therefore not equipped to perform his duties. - The airport failed to ensure that 13 firefighters received recurrent aircraft familiarization training. - The airport did not inspect its tenant fueling facilities between July 2014 and March 26, 2015. - The airport on 14 dates conducted daily self-inspections at night rather than at sunrise, as required by its Airport Certification Manual. - On Sept. 26, 2015, one of the airport’s two ARFF vehicles was not operational because the roof turret did not work and duct tape was used to seal cracks in a waterline to the roof turret. - The FAA also alleges the airport’s air carrier runway had a larger than permitted hole in it on March 25, 2015. Mercedita Airport - On nine dates in March 2015, the airport conducted daily self-inspections in the afternoon or at night rather than at sunrise, as required by its Airport Certification Manual. 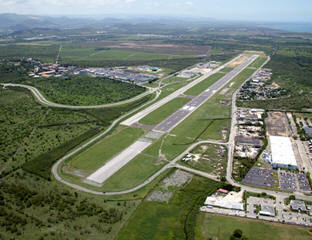 Antonio Rivera Rodriguez Airport - The airport’s ARFF vehicles did not have required two-way radio communications with the airport fire station on March 24, 2015.